Richard (now Radhanath Swami) was glad to meet Shyamsundar, the devotee who had fed him spiritual food at the Cosmos in Amsterdam, and had taken interest in his well-being in Bombay. Shyamsundar happily described about his spiritual master, Srila Prabhupada, to Richard. He explained that Srila Prabhupada led the most incredible kirtan for over two hours at the Avlon Ballroom in Haight-Ashbury, San Francisco. Richard just couldn’t imagine an elderly saint from Vrindavan living in the world capital of Hippie culture, and was amazed to see Srila Prabhupada transform hippies into ‘happies’. Richard also learnt that Srila Prabhupada touched the hearts of the Beatles and especially of George Harrison who became close friends with Srila Prabhupada and his disciples. 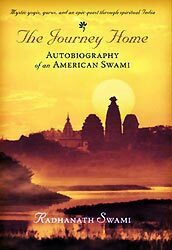 Shyamsundar also narrated to Richard (now Radhanath Swami) about Srila Prabhupada’s visit to Russia, which was then under the Iron curtain. With his charm, humor and precise logic he taught Anatoly, a Russian boy about Krishna Consciousness. Richard was wonderstruck to hear that in the height of the Cold War, Srila Prabhupada was in Moscow teaching the path of Bhakti-yoga to a Russian. Srila Prabhupada had also felt that in India religion was waning and hence brought his Western disciples to India to show the Indians the glory of their own culture. 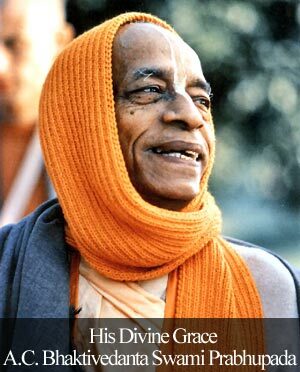 Srila Prabhupada often said that with India’s philosophy and America’s wealth, the world can really prosper. Radhanath Swami recollects that with all these achievements what touched his heart the most was the humility of Srila Prabhupada. When one guest asked him if he was the guru of the world, Srila Prabhupada meekly bowed his head and said, “I am everybody’s servant. That’s all.” Radhanath Swami recalled the humility of Ghanshyam and saw that externally Srila Prabhupada was different from Ghanshyam, yet both had humility. Besides, this humility empowered Srila Prabhupada with unlimited confidence and determination to spread the teachings of spiritual wisdom. Radhanath Swami once gave a class on Ghanshyam at Vrindavan, at the same place where Ghanshyam worshipped his deities Radha Gopijana Vallabha. After glorifying Ghanshyam, Radhanath Swami then spoke how he found the same traits in Srila Prabhupada. No sooner had he begun speaking about Srila Prabhupada, Radhanath Swami choked with emotion and cried tears of gratitude to both these special devotees of Krishna who had most deeply touched his heart. 11/05/2010 • God – the greatest or the sweetest? 10/04/2010 • Is God a person? Radhanath Swami has really understood the feelings of his guru – Srila Prabhupad. Radhanath Swami Maharaj is showing how an ideal disciple should be! It is Srila Prabhupada’s compassion and mercy that he started ISKCON at the age of 70.It is Srila Prabhupada’s compassion and mercy that he has gifted his dear disciple Radhanath Swami to Mumbai for our benefit.Like Prabhupada, Radhanath Swami is also an epitome of humility. We as followers of Srila Prabhupada and his disciples should inculcate this quality of Humility in our heart. Humility is the quality dear-most to GOD, and His true followers. This is an amazing meditation on Radhanath Swami’s feelings for Srila Prabhupad ! Thank you. a brilliant post, that’s all i can say…. Radhanath Swami has shown us the path of his spiritual master Srila Prabhupada. If we try to adopt this simple principle of humility, we would progress on the path of spiritual understanding very fast. Wonderful.All Glories to Srila Prabhupada. Radhanaath Swami always wants his disciples to follow Srila Prabhupad’s instructions as their life & soul. Radhanath Swami shows by his own behavior how a perfect disciple should be. Every time I finish the Journey Home, I pick it up and can’t help but read it again and again. The instructions, and the personal story, and of course the personal connection has magically created a wonderful bond to Srila Prabhupada and the rest of our Guru Parampara. This is a wonderful post. Thank you very much for sharing. Radhanath Swami Maharaj loves his Guru! Srila prabhupad always had the mood of being a humble servant of his guru and Krishna and we can see that Radhanath swami also also carries the same mood as his spiritual master srila Prabhupad. Very inspiring article…..Radhanath Swami has learnt humility from great souls & he in turn is teaching the same to his disciples with full conviction & determination….. Most wonderful article. I beg to ask who is this fan of Swami Radhanath, who is writing such wonderful purports to Swami Radhanath’s book. Very true ……..Humility is the key to success in bhakti . Radhanath Swami Maharaj is deeply devoted to Prabhupada. Radhanath Swami Maharaj’s words are very inspiring. This is clearly an example of humility by H.H Radhanath Swami Maharaj. Srila Prabhupada’s Life is an defining moment in the History of the world, his movement is propelled by the underlying principle of Love and compassion and hence leaders of the world are scared to popularize it, for in today’s time though leaders talk of Love and Peace, if one looks around the Hypocrisy, facts are evidence to what is actually the agenda. Following the guidelines prescribed by Srila Prabhupada, Radhanath Swami and his God brothers are caring on the legacy for creating Love and compassion among all souls. Radhanath Swamis book “The Journey” brings out these basic essence in a tale told with great Love and conviction. humbleness with affection is very much required to make progress in spiritual path. Radhanath swami is a great ideal in front of us to ourselves humble. humbleness with affection is very much required to make progress in spiritual path. Radhanath swami is a great ideal in front of us to make ourselves humble. Radhanath Swami’s logic from physics to explain how Humility attracts the Lord is so fantastic.Thankyou Maharaj. Maharaj has stressed again on importance of humility in making spiritual progress. Thank you. 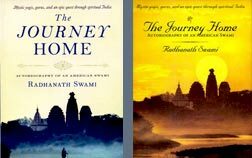 Thank you very much for such a nice write-up on Radhanath Swami Journey Home book. What Srila Prabhupada has done cannot be comprehended by us in this generation, but decades from now, centuries from now, people will marvel as to who was this extraordinary personality in parampara who walked into history. Srila Prabhupad’s compassion and humility are unparalleled. Following in his guru’s footsteps Radhanath Swami Maharaj also exemplifies these qualities through his behaviour. Glorifying others also needs humility. Radhanath Swami glorifies others with all his humility. All glories to Radhanath Swami. Amazing!Maharaj’s love for his guru Maharaj. Very Touching and Inspiring article – A person who could do great things and maintain humility of the heart, charity of the heart, goodness of the heart is a person who could actually make a difference in people’s lives in a very positive way. Thanks a lot for the nectar. Radhanath Swami was so sincere in his desire that the Supreme Lord led him to the right destination and his spiritual master. Radhanath Swami has rightly understood the mood of his spiritual teacher and imbibed same in his character. This is the sign of a true disciple.